Despite the fact that Ukraine is a young country-exporter of fresh apples, USPA FRUIT is already known as successful exporter to more than 12 countries in EU, Middle East and Asia. Due to the latest technologies, USPA FRUIT is able to work for 12 months without interruption and it enables to provide the buyers by apples whole year around. The key concept for this company is clear standards for packaging and transportation. Following this concept, all the apples pass control during harvesting, post-harvest application and applying special regime of cooling for long term storage. 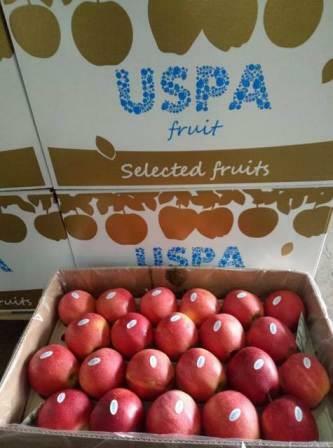 USPA FRUIT quality auditors check each unit of apple packaging, which is especially important for deliveries to the countries, in order to ensure the weight of each package according to the standard of 18 kg per box, net weight. The main export of apples from Ukraine, traditionally, was carried out by road, so the USPA FRUIT company is especially attentive to meeting the schedule for delivering ships to the port and building a port logistics system, since the company exports all apples under CIF conditions in order to provide maximum service to its customers, guaranteeing the quality of apples at the port of destination and delivery in time. Volodymyr Gurzhiy, USPA FRUIT CCO comments: “Suppliers from Ukraine are the future key players in the global market of fresh fruits and vegetables, which already confidently occupy space on the shelves of supermarkets. We are pleased that USPA FRUIT plays an important role in this process, actively supplying Ukrainian apples to the world’s largest retail chains, aggregating thousands of tons of high-quality apples from Ukrainian farmers in packaging adapted for efficient sales in modern retail chains. Juicy, crispy Ukrainian apples with intensive taste and aroma are increasingly preferred by consumers who have tried them at least once”. To know more about USPA FRUIT visit Fruit Logistica 2019 Hall 10.1, Stand А-04.